In the last Fun Food post, I featured the fireworks cupcakes. Now, we are going to take a look and consider making actual individual firecracker cupcakes just in time for the 4th of July! There are really easy instructions with lots of photos shared on the Sweet & Crunchy blog at OhNuts which makes creating your own fireworks cupcakes a breeze. Well easy that is, we might not want a breeze when playing with firecrackers. 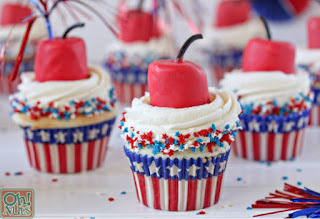 These would truly be de"light"ful cupcakes to serve on the 4th of July. Wilton 415-2315 Patriotic Cupcake Decorating KitCheck PriceBy selecting the right 4th of July cupcake liners for your cupcakes, you are already halfway finished decorating these cupcakes, but the colored marshmallow firecrackers really do make these cupcakes quite unique. You will be surprised at how easy it is to color your marshmallows. The supplies you need to color your firecracker marshmallow are available at OhNuts.com. It is not just red food coloring either. A much tastier treat is used to color the marshmallows, but I shall let you discover that secret when you visit OhNuts. It is simply amazing how they really do look like little firecrackers too! The Fireworks cupcakes would be perfect for a fourth of July party or to make as special treats for your family. Hard to believe the 4th of July is coming up so quickly! These cupcakes are a very fun reminder. Wow! (and Pow! They look to pretty to eat :) Fun idea for the holiday.